Articles bemoaning the habits, trends and beliefs of younger generations are a time honored tradition. The Millennials are certainly no exception. As they continue to age into adulthood, Millennials will reshape many aspects of society and the economy. However probably less than many of the so-called think pieces predict. There is a reason our office calls the 25-34 year age group the root-setting years. It is when most individuals settle down, begin their careers in earnest, get married, buy a house and have kids. While Millennials may be doing this a couple years later than past generations, they are still following the same general life cycle of behavior. All that said, when it comes to demographics the Boomers were different. We can lose sight of this fact today now that Millennials and Gen Z or whatever we end up calling those after the Millennials are similarly large in size. 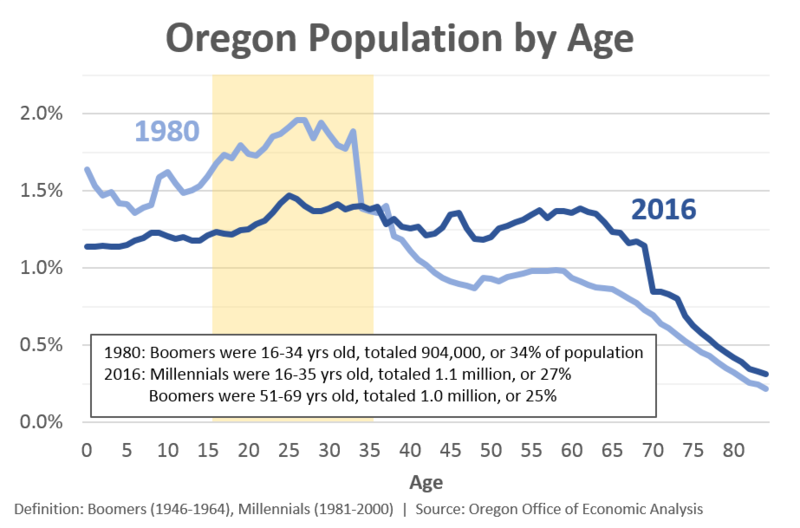 However back in 1980, Boomers were essentially in the same age groups as Millennials today, and they represented a significantly higher share of the population. As such, while trends and behaviors of Millennials will reshape society, the marginal change is unlikely to be as large. Note: There is a standard definition for Boomers. They were those born between 1946 and 1964. No such standard exists for Millennials. Most analysis use somewhere in the 1980-1983 to 1997-2000 range. I use 1981-2000. That does mean Millennials get one additional year in their group, but it does not impact the analysis much. That extra year is worth about 1.2% of the population distribution. Josh, I was working on this very topic day before yesterday! Hereâs my initial (rough) graph: â¦ enjoy!